Qualcomm Toq has been surely one of the sweetest SmartWatch of 2013 with its all rounder features except the price tag of $350. So just before MWC 2014 Qualcomm decided to cut its price by $100. The device will now be available at $249.99 for both the black and the white versions. 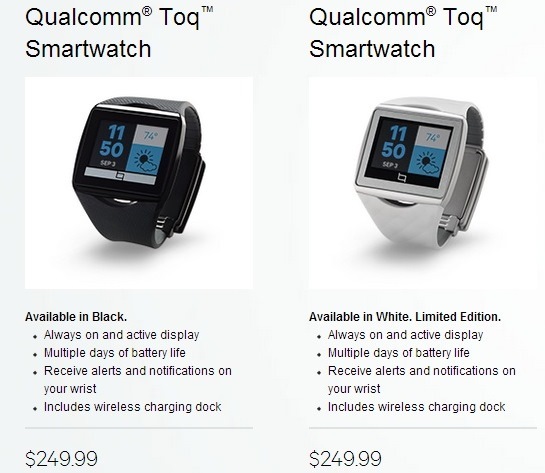 The Toq is Qualcomm’s first attempt at the nascent smartwatch category. The unique feature about this watch that set it apart from the Pebble was the presence of a color Mirasol display, also developed by Qualcomm. The revised pricing brings it on par with the new Pebble Steel but while the Toq may have a color display and a few other things up its sleeve, it can’t compete with Pebble’s growing app catalog nor its stylish and elegant design. If Qualcomm wants it to succeed it would need to consider more severe price cuts.